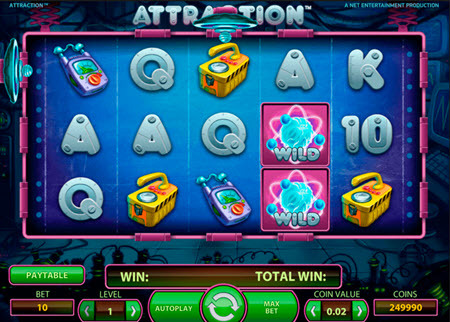 Attraction is a colorful slot from NetEnt focused on physics and engineering. This slot is suitable when you are in the mode for a game where all the focus is on the basic game play, because Attraction has no bonus round or free spins round. Instead, the main feature of this game is the super powerful wild symbol which can expand over the whole reel, freeze in place and hand out a re-spin. 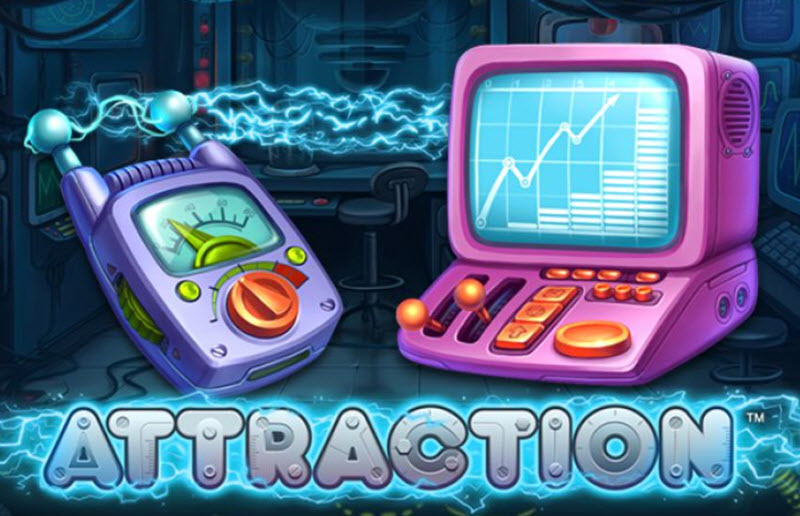 The theme for Attraction is physics and engineering. Various measuring instruments can appear on the reels, along with a transmittor, a computer and an atom. You always play with all 10 paylines active on Attraction, which means that the smallest possible bet is 1 coin x 10 paylines = 10 coins. With the smallest possible coin value, this means a €0.20 wager per spin. You can adjust how many coins to bet per payline, from 1 coin to 10 coins. Accordingly, the largest possible wager is 10 paylines x 10 coins = 100 coins. With the coin value €1, this is a €100 wager per spin. The wild symbol in Attraction is very powerful. It can expand, freeze in place, and hand out a re-spin. If all five reels get covered in wilds, you win 50,000 coins. If you are playing with the coin value €1, this means a €50,000 win.